Sn0wbreeze 2.8b10 has just been released to jailbreak iOS 5 and iOS 5.0.1 (Beta 1 and Beta 2) on Windows. While the current version of Redsn0w, version 0.9.9b8 for Windows and Mac, can already jailbreak the above mentioned iOS updates, the added advantage of Sn0wbreeze is that it fixes iBooks crashing issue on devices running jailbroken iOS 5.0.x. Apart from this, Sn0wbreeze also removes the UDID requirement for iOS 5.0.1 betas. What this means is that even non-developers can install iOS 5.0.1 without having to have a registered account on iOS Dev Center. – Fixed iBooks sandbox crashing issues (as of 2.8b9). – Re-added iPad baseband install option to iPhone 3GS. – Removes UDID requirement/Beta timer in 5.0.1. For those of you who don’t already know, both Sn0wbreeze and Redsn0w can be used to preserve the old baseband by cooking a custom firmware file that can be restored on iPhone via iTunes. This is important for iPhones which rely on a Gevey SIM or Ultrasn0w unlock. Since the how-to instructions are exactly the same as the last release, you can follow our complete step by step guide posted here to jailbreak iOS 5 and 5.0.1 on iPhone 4, 3GS, iPad 1, and iPod touch. Just like all the other iOS 5.0.x jailbreaks, this one too is limited to tethered boot only. 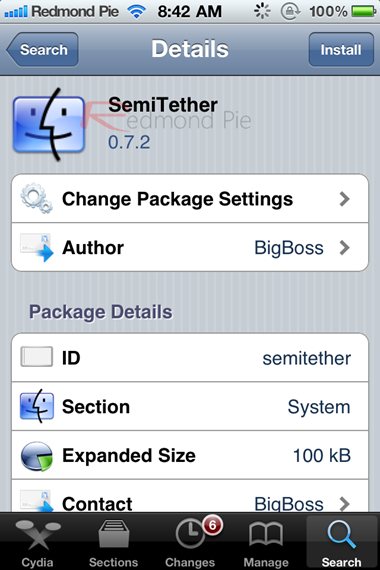 But you can optionally use SemiTether patch from Cydia to get semi-tethered jailbreak on devices already jailbroken on iOS 5.0.1 and iOS 5.0, installation instructions for which can be found here.